For many registered nurses, career advancement is a key goal. Continuing education is often a key step to reach this goal. Cambridge College of Healthcare & Technology’s Bachelor of Science in Nursing program helps nurses gain the education and skills needed to increase their job responsibilities or move into key leadership roles within healthcare organizations. Why Choose Cambridge for Your RN to BSN? At Cambridge, we know you have many options when selecting a nursing school. We also know that choosing the right program for your goals, personality and schedule can be a challenge. We’re here to help you understand everything we have to offer, and to guide you as you make this key decision. Flexibility: Our RN to BSN program’s online delivery allows you to continue working while advancing your education. This helps you learn, without sacrificing any of your personal or professional responsibilities. Commitment to students: Cambridge is expressly focused on the success and well-being of every one of our students. Our faculty and staff is here to help you succeed, to help you grow and to help you take the next step in your nursing career. Whenever you have questions or concerns, we are here to help. Focused classes: Our small class sizes give you increased access to educators. Rather than becoming just another face in a crowd, you’ll have the chance to create real, lasting relationships with professionals who are passionate about the art of nursing. Tailored curriculum: The RN to BSN program has been carefully designed to include key curriculum delivered in a streamlined manner. You’ll learn everything you need to know to advance your career, and do it in a timely and efficient manner. Tradition of excellence: For years, we’ve helped nursing students take the next step in their careers. Through a mix of quality classroom learning, hands-on clinicals and mentorship, we’ve armed nurses with the knowledge and skills necessary for personal and career growth. 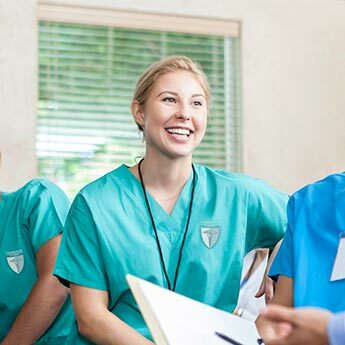 Following successful completion of the program, you’ll have the knowledge and skills needed to practice safe, quality patient care, lead peers, promote practice quality improvements and much more. * 77 semester credits will be awarded for satisfactory completion of a state Board of Nursing associate or diploma level registered nurse education program, for unrestricted state licensure as a registered nurse, and for demonstration of admission requirement of successful completion of 21 semester credits (or equivalent) of general education courses and required pre-requisite courses. Examine health care policies, finance, and the regulatory requirements of the profession and nursing practice.